You claim you want to be heard. So you write your hollow words. You fill your life with deception. Because it’s all about perception. The world sees you one way. And they listen to all you say. My first thought I had upon finishing P.S I Like You was that this book reminds me why I love Young Adult Literature in the first place. It’s happy. It’s sweet. P.S I Like You pulls you out of your own reality and into one of the cutest contemporary novels I have ever had the pleasure of getting my hands on. Having a bad day? Read it. Someone spit in your coffee sort of deal? Read it. P.S I Love You, I have discovered, is the newest universal salve to anything remotely upsetting. I can honestly tell you that I don’t think I have ever been this swept away by a contemporary romance. It’s just so… normal. You know, every once in a while, I could use a good dose of normal – and this book does just that. There is nothing fancy. No super bad boy turned good, no witness protection, no extra curricular activities or trips around Europe. P.S I Like You is wonderful because it is simply the story of a girl falling in love with a boy through one of the most adorable, romantic cliches in history: writing secret, anonymous letters. Can I just say it was about a ten point squee on the D’aww scale? We meet Lily, a girl who is struggling to pay attention in Chemistry so she writes lyrics and random thoughts in her journal instead until she can focus. However, when her teacher catches her writing and takes her journal away, she is left with nothing to do but suffer through the hour of Chemistry… until she writes some lyrics on the top of the desk, and someone writes back. This starts possibly the cutest clandestine note/letter passing I’ve ever seen in the history of books. Which, of course, eventually turns into something more – and it was beautiful and everything I needed it to be. I really liked Lily as a character. I found something comforting in the chaos of her life. It was like this reminder that it’s okay to struggle when everything around you is going bottoms up. You know? It’s okay to let the utter chaos of your family and your siblings consume you for a while. It’s okay to struggle in class, it’s not the end of the world. For me, Lily was so easy to relate to it was almost scary. She’s not perfect, she’s normal. It was nice to read a book about a normal girl doing normal things and struggling through normal, everyday life. Plus, she is completely and totally flawed. She’s opinionated, stubborn, sometimes she’s selfish when it comes to her family. There are moments where all she wants is to shut the world out, shut everyone and everything out and take some time for herself. I think we can all relate to that, even if only a little bit. I think, in fact, one of my favorite things about reading this book was just how easy it was to fall into. I could so clearly imagine myself there, in Lily’s shoes or watching all of this happen, and it was the perfect escape from the chaos in my own life. It was my moment, and that’s something special. I do have to comment on the romance, because, as I said, ten point squee. However, I cannot talk about said love interest because it is a spoiler and I refuse to do that to you guys. I can tell you this, though, TEN POINT SQUEE ON THE D’AWW SCALE. Get the picture? It’s so much slow-burn, cute, head-over-heels awesomeness that I get all fluttery just thinking about it. They fall in love by sharing letters. LETTERS! How cheesy and romantic is that? UGH. I don’t care I saw the big reveal coming from miles away simply because the romance completely took over my little fangirl heart. I ship them, so hard. So hard. 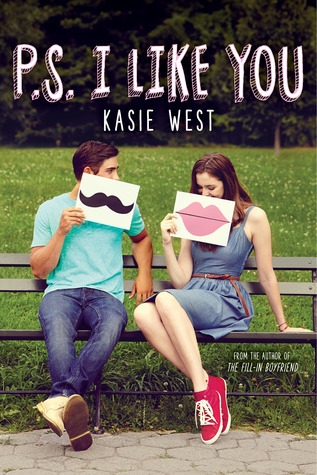 P.S I Like You is the perfect book to pull you out of a funk or brighten your day. It will make you smile, make you laugh, make you cry. Lily and her family will worm their way into your heart and you’ll never want to let them go. If you’re not smiling by the end of the book, I give full permission to come after me with pitchforks and torches. Read it. Love it. Cherish it, just like I will.